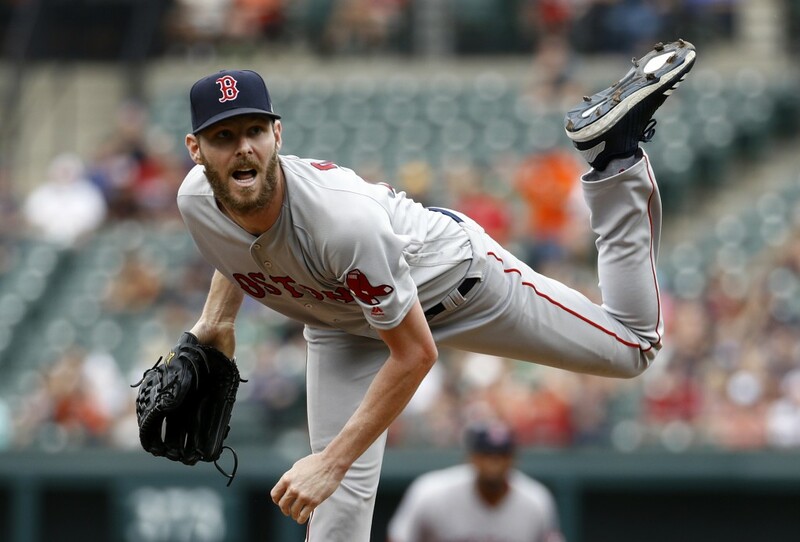 BALTIMORE (AP) — Chris Sale celebrated his return from the disabled list by striking out 12 over five dominant innings, and the Boston Red Sox moved 50 games over .500 by completing a sweep of the lowly Baltimore Orioles with a 4-1 victory on Sunday. NEW YORK (AP) — CC Sabathia threw six shutout innings, Giancarlo Stanton homered again and the Yankees won for the sixth time in seven games. CINCINNATI (AP) — Paul Goldschmidt hit two of Arizona's five homers, and the Diamondbacks avoided a sweep. DETROIT (AP) — Matthew Boyd pitched six strong innings and the Tigers beat the Twins on Jack Morris Day at Comerica Park. MIAMI (AP) — Jose Reyes hit a two-run homer and Noah Syndergaard struck out seven in seven innings, leading the Mets to the victory. TORONTO (AP) — Kevin Pillar scored the tiebreaking run on an infield grounder in the sixth inning, helping the Blue Jays avoid a three-game series sweep.